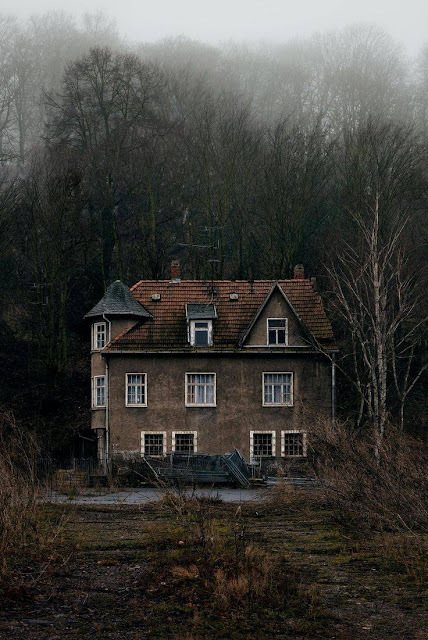 The house stood, tucked into dark woods, at the end of a dirt lane. Many claimed it was cursed, haunted, or under some terrible bane. Even in the hearts of those who scoffed, there was a feeling of Doubt. No door ever opened, no window broken, for fear of letting something out. A young couple had bought the house, the wife, pregnant with child. The young man painted and repaired; together the two washed and cleaned. The Forbidden Home restored, floors, windows and walls, they all gleamed. The couple wondered why no visitors came, from any neighborhoods. Thought probably because so far out that lane, surrounded by woods. Winter storm raging, snow drifting; from trees, many limbs being torn. Of course this would have to be the night the baby decides to be born. The husband goes to the phone, what he finds fills him with dread. No dial tone, because of the storm, the phone has gone dead. He starts for his wife in the bedroom, he has to explain, tell her something. When to his great surprise, that phone behind him bursts forth in a ring. He hears a woman saying, "I'm sorry, I must have dialed wrong." She doesn't hang up, as he tells her that his wife is in labor. His phone won't call out, he needs help if he is to save her. Then he sits with his wife, praying, wishing he could do more. In the storm, he heard no car, but there's a knock at the door. The Doctor introduced himself, said ''I'm Jonathan DeGrace. You've done wonders here, now one could love this old place." A new life entered this world, a sweet baby boy was born. He sponged off the child, lifted it to its' mothers breast. Told the father, "You're all tired, please try to get rest." The Doctor looked at the three, an old man's kindly smile. They awakened just past dawn to sunshine, the storm gone. Father went to thank the Dr, after checking wife and new son. He was nowhere in the house, no car outside, nothing at all. His wife said, "The Dr must have had to answer another call." The three drove into the Village, to thank and bless Dr DeGrace. But asking after him, were told he didn't practice in that place. One old woman, said "Dr DeGrace? Sit and his story I'll tell. My Mother told me that he was a man of neither Heaven nor Hell. He believed not in God, but had a demeanor both kindly and mild. Said to the Priest, he'd battle any power for the life of a child. When I was a girl of five, there was a yellow fever outbreak. None knew whose life would be the next it would take. Jonathan DeGrace went without sleep, fighting to save any life. But in the midst of that horror, the fever took his pregnant wife. He felt he had failed her, in spite of all those ill that he did save. For months after that, he spent days kneeled by her grave. One day he walked into those woods, facing away from town. Others searched for weeks, but his body never was found. Yes, your old house was his home, he and his dear wife. She died here in town, he despaired, then took his own life. So last night in the storm, you prayed for your baby and spouse. Not Satan or Hell could have kept his Spirit from his old house." Went to the old house, their home,with love and joy in their hearts. They had many more children and on any time, day to day. The old house ever rang with the sound of children at play. Their oldest, a boy born in a storm, his name was a key. Went away to college, studied eight years, got his degree. Came back with his license, now a good man grown. Now called Dr Jonathan, practices there in that town. Anything can be changed when love makes new seed sown. None now name that house near the woods, The Forbidden Home.